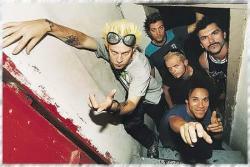 Powerman 5000 (sometimes abbreviated to PM5K) is an American rock band formed in 1991. The group has released seven albums over the course of their career and gained their highest commercial success with 1999's Tonight the Stars Revolt!, which reached No. 29 on the Billboard 200 album chart while spawning the top 40 hits "When Worlds Collide" and "Nobody's Real". Their latest release, Builders of the Future, came out in 2014 through T-boy records, and the group has been on tour in support of the album. Frontman and only original member Spider One is the younger brother of fellow metal musician Rob Zombie.